Here are several stats you may not know from the Packers 27-23 victory over the Detroit Lions on December 3 (the stats all reflect regular season games unless otherwise noted). The win over the Lions assures the Packers their 10th straight season with at least three wins in the division. Their last sub-.500 record within the division was in 2005 when they were 1-5. This was the first win in Packers history where they allowed 17 or more points in the first quarter. Sixteen times since 1945 the team allowed opponents to score 17 or more points in the first period; in the previous 15 games they eventually lost that game. The Packers were scoreless at halftime for the 14th time since 2000. They are now 4-10 in those games. Their 14 games being scoreless at half since 2000 is tied for the third fewest in the league. The Saints have only been scoreless at halftime nine times in that timeframe. NFL teams since 2000 are 107-622 (.147 winning percentage) when they do not score in the first half. This was the 12th time since 2000 that the Packers were behind by 17 points or more at halftime. This was only the second win during that time. The other win was on December 15, 2013 when they were behind 26-3 at half to the Dallas Cowboys but eventually won the contest 37-36. Both of those games were on the road. Green Bay scored 14 points in the third quarter. Since 2006 they are now 22-4 in games when they score 14 or more points in the third quarter. Since 2000, the Packers have been behind going into the fourth quarter in 47 road games. This was only the sixth win in those games. The team is 4-13 in games on the road where they are behind by six points or less going into the final period. The Lions made three field goals in the game. 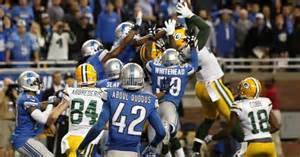 Green Bay is 16-24-1 games since 2000 when the opposition makes three or more field goals in a game. Tight end Richard Rodgers had eight receptions for 146 yards in the game. He is the first tight end since Jermichael Finley in 2010 to have over 100 yards receiving in a game. Rodgers is the first TE for the Packers in the Super Bowl era (since 1966) to have 140 or more receiving yards in a game. Aaron Rodgers had a rushing TD in the contest, the 21st rushing TD of his career. The Packers are 11-9 in the games where Rodgers has had one or more rushing TD. Rodgers also had two TD passes; the Pack is now 7-3 in games when Rodgers has two or more passing TDs and a rushing TD in the same game. The Packers scored 27 points in the second half. Since 2000, the Packers are 9-0 in games when they score 27-plus points in the second half. In the Super Bowl era they are now 22-2 in games when they tally 27 or more points in the second half. Green Bay had less than 70 yards rushing (24 carries for 67 yards). Since 2006 the Packers are 14-13 in games where they are held under 70 yards rushing in a game. They have been held under 70 yards rushing twice this year… both games against the Lions. Rodgers completed two-thirds of his passes in the game, 24-for-36 (66.7%). The Packers are now 50-9 in games Rodgers starts when he completes 66.7% or more of his passes. They have now won nine straight in those games. Green Bay must win their January 3 home game versus division rival Minnesota to avoid their first season with no home wins versus division opponents since 1973 when they were 0-2-1 in home games versus division foes. They were also 0-3 in division home games in 1968. It’s interesting to note that the Pack was 3-0 in division games on the road this year, the first time since 2011.